Taking transit provides some obvious benefits, like saving thousands of dollars a year on gas, repairs and car insurance and having the freedom to safely use the phone that’s become an extension of your right hand. 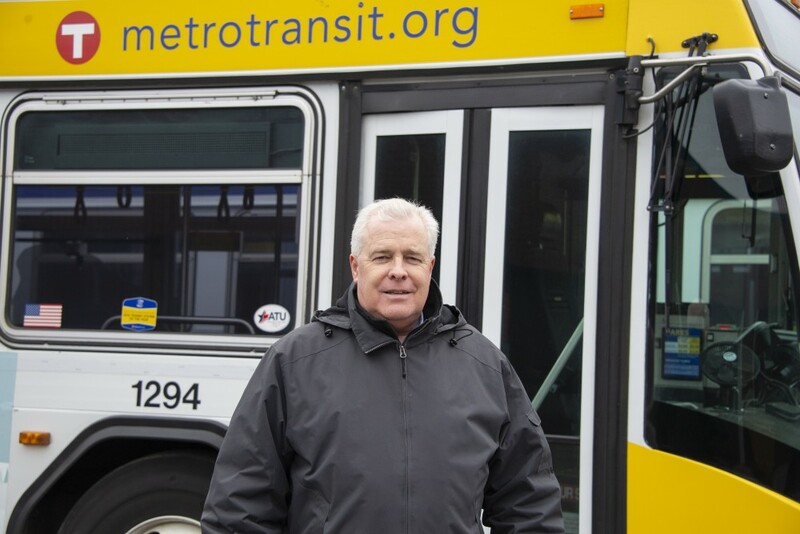 But as many Metro Transit employees can tell you, there are many other reasons to Get on Board. 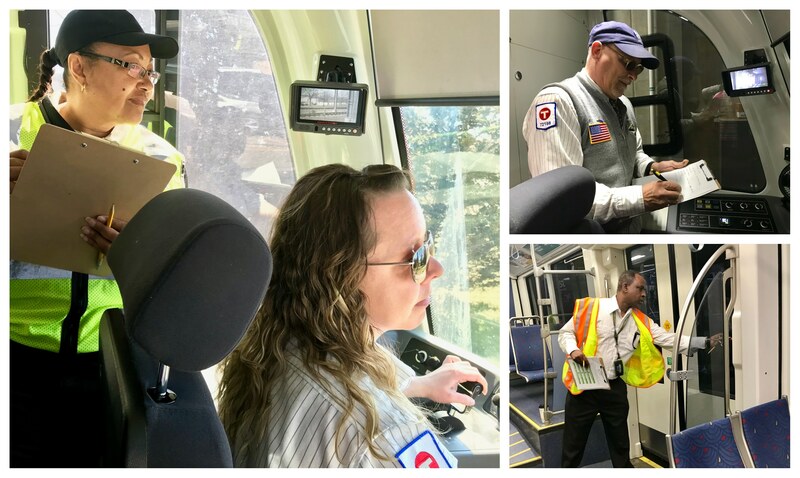 To celebrate the American Public Transportation Association's National Get on Board Day, we’re highlighting some of the unique reasons our employees chose to take the bus or train. Tell us why you ride for a chance to win a $50 Go-To Card. 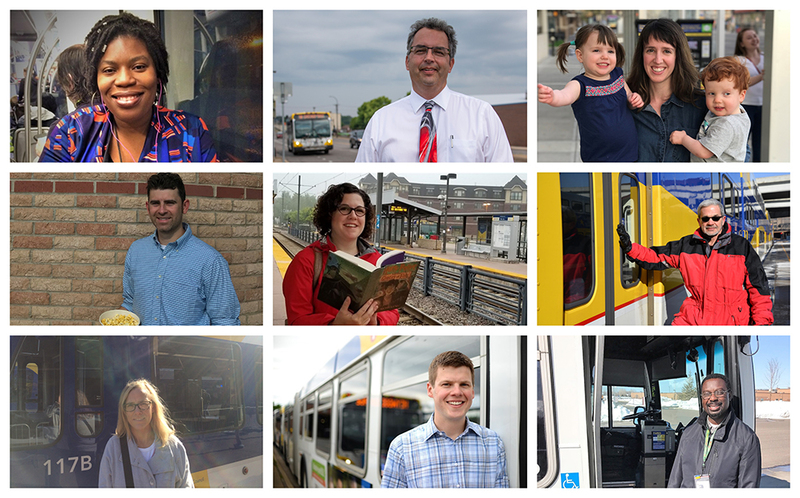 E-mail ridersalmanac@metrotransit.org or share your reason on Twitter using the hashtag #getonboard. We’ll chose three responses at random. My commute acts like a daily meditation. Not having to drive gives me the time and freedom to de-stress by just listening to music in my headphones. This is especially important to me to help me mentally prepare for each day during my morning commute. Usually I read or do crosswords on my phone – I’m 20 years late but am finally reading the Harry Potter series. You never know who you’ll meet on board. Recently, I became reacquainted with a friend from college who rides the bus. Now we catch up often. I like how my daughters and I have had random positive encounters with perfect strangers. A lady on Route 10 once gave my youngest daughter a fresh flower from her bouquet. Every once in a while there are moments with a real sense of shared community. I’ve seen people immediately surround and care for someone who fainted and I’ve laughed along with everyone else when a little kid said something funny. It’s a good reminder that we’re all in this world together. My commute is sometimes the most relaxing part of the day. It feels good to come into the office after a little physical activity and fresh air, or to catch up on the news or a podcast while riding the train. The benefits for me are immense. I get regular exercise from walking – frequently taking more than 10,000 steps a day. My wife and I bought a house near the Blue Line’s 46th Street Station about 11 years ago because we wanted walkable and green areas nearby and wanted to live near light rail. Thanks to the convenience of the Blue Line, about four years ago we started sharing just one car. I had a woman tell me twins are good luck in her culture and asked if she could sit next to us. Another time, my kids were crabby and an older gentleman started singing Sinatra to them. People really identify with children and when they see them on transit they want to say hello. It’s a smoother commute both ways with few surprises. Going home, I traded the stress of fighting the traffic for fighting to stay awake, so I didn’t miss my stop. I’ll take that trade. Riding transit is 100 percent “me time.” I can read, play Candy Crush, catch up on e-mails, or listen to podcasts. 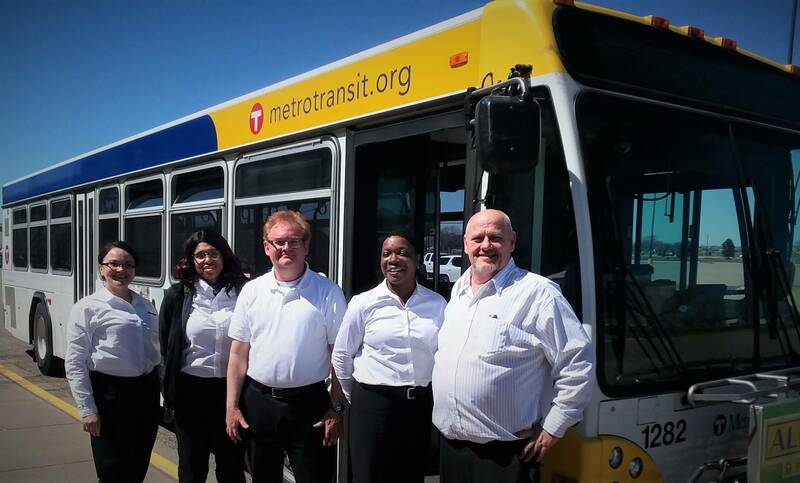 Many Metro Transit employees are committed to sustainable transportation, riding the bus or train, biking or walking to work and other destinations across the region. These “How We Roll” profiles illustrate how much we have in common with our customers when it comes to how we get around. See you out there! I commute almost exclusively on transit. My commute usually begins and ends at SouthWest Transit's SouthWest Station in Eden Prairie. Depending on the weather, I either walk or transfer to another bus to get to the Heywood Office where I work. Sometimes I'll park at the Blue Line's 28th Avenue Station Park & Ride and take light rail. Service Development has a friendly competition and a traveling trophy for whomever takes transit, bikes or walks every month. Last year, I took 752 transit trips. That might sound like a lot, but I have co-workers who have taken even more trips! What do you enjoy most about your commute? I enjoy avoiding the headache of driving and dealing with traffic. Considering all the transit advantages we have now -- including MnPASS and shoulder lanes, and Marq2 in downtown Minneapolis -- I’m always surprised at the number people who continue to sit in traffic in their cars as my bus goes past. How does taking transit impact your work? I try to use transit as much as possible during the work day. I plan service in St. Paul and surrounding communities so I often find myself taking the Green Line to get to meetings in the East Metro. We have terrific tools that help planners make better decisions about our service, but there's no substitute for personally experiencing what our customers experience. Are there any other transportation services you find invaluable? Transit has been important to my entire family. About 8 years ago, my mother quit driving and started using Metro Mobility, the Council's transportation service for individuals who can't use regular route transit. Without Metro Mobility, our family would have become responsible for all her transportation needs or she would have needed to live in an assisted living facility much earlier than she did. Instead, she was able to continue living independently at her home in Richfield. She couldn’t say enough good things about how kind all the drivers were to her and how deeply she appreciated the service. My family and I will always be grateful. (Left to right) Bus Trainees Linda Wilke, Erica Young, Steve Gartner and Patricia Young join Instructor Ken Johnson for a chance to drive a bus on a closed course. Before they can pick up any customers, new hires on their path to becoming bus operators must get behind the wheel and show they’re capable of handling what may be the largest vehicle they’ve ever driven. For prospective operators who have never driven a bus before, passing the required road test and earning a Commercial Driver’s License (CDL) can be a significant hurdle, potentially disrupting an otherwise promising career just weeks after it began. 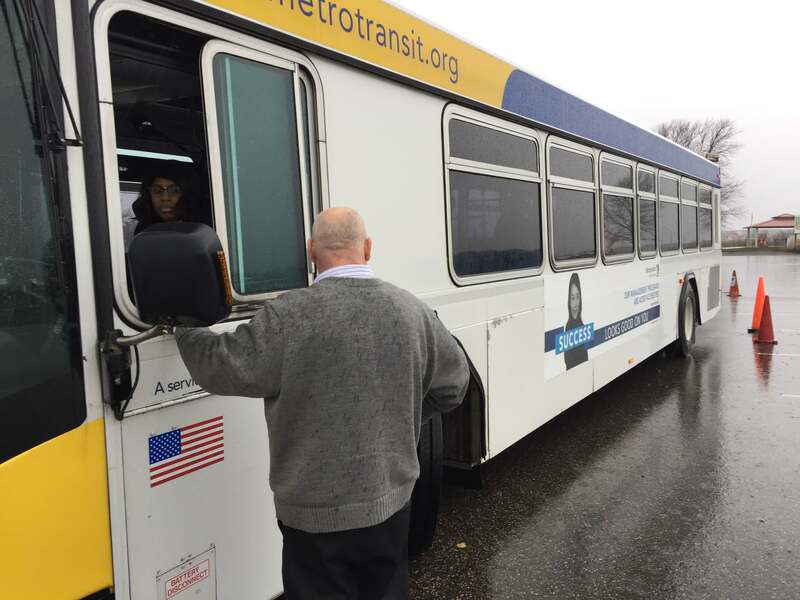 To help address that barrier, Metro Transit is now providing unfamiliar, prospective operators the chance to spend several hours driving a bus on a closed course before taking their road test. The hope is that this experience will help participants earn their CDLs and continue in their training. “This is just to give you a feel of the bus and to get the jitters out,” Relief Instructor Ken Johnson told a group of new hires who gathered last week at a Metropolitan Council facility, where a parking lot became a temporary, asphalt classroom. The group that assembled last week was the first to get some practice in before taking their road test. None of the participants had driven a bus before or had yet obtained a Commercial Driver's License (CDL). Patricia Morgan was surprised to find the turn signals by her feet, and to learn that moving from forward to reverse meant pushing a button. “Now when I get into my car I start looking for the right buttons to push on my dashboard to put it in drive,” she said. Another big takeaway, participants said, is how strongly safety is emphasized. Instructor Johnson talks through an alley back-in with trainee Young. This is one of the more difficult maneuvers in the CDL test. Providing more hands-on experience is part of a larger effort to make the path to becoming a bus operator at little less daunting. Job seekers can get help completing their applications and studying for their Commercial Driver’s License Permit, a prerequisite to getting a CDL. New hires are also being matched with experienced operators through a mentorship program. Erica Young is among those benefiting from the extra support. Young tried to get her CDL on her own but came up short. 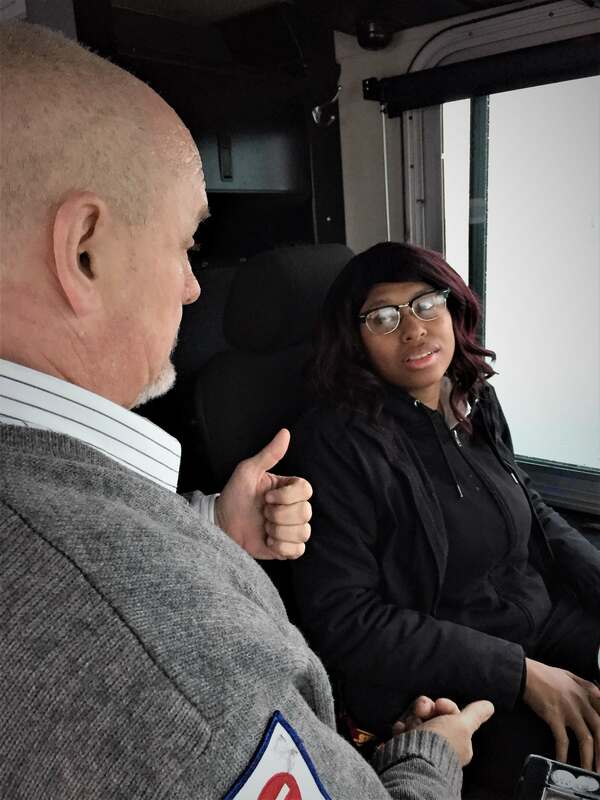 But after taking a CDL study course provided by Metro Transit, she earned her CDL permit and found herself among those taking the wheel of a bus for the first time last week. While there’s a long road ahead, her confidence showed as she put the bus into reverse, correcting course to avoid hitting a cone. Backing up is one of the more difficult maneuvers in the CDL test. Johnson debriefs Young with a thumbs-up after the alley back-in. A light rail vehicle carrying METRO Green Line customers to their destinations now doubles as a work of art. The outside of the vehicle shows a caterpillar becoming a monarch butterfly. Inside, the walls are covered with illustrated scenes of moose, mice and other furry creatures exploring local landmarks like the Minneapolis Sculpture Garden in every season. 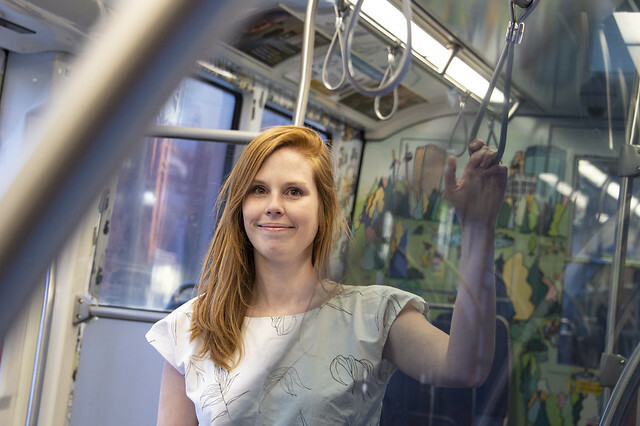 The unique display is the culmination of a partnership between students at the University of St. Thomas, St. Paul-based artist Sarah Nelson and Metro Transit. Last fall, students in a Leadership for Social Justice course conducted a series of interviews about the connections between transit, sustainable communities and social justice. The interviews provide the foundation of a recently published book, Transit Transformations. Nelson’s hand-drawn illustrations of a monarch butterfly adorn the cover of that book and were adapted for the exterior of the light rail vehicle. The monarch was chosen for the book cover because transformation was a common theme in the interviews. The illustrations inside the light rail vehicle were purely Nelson’s vision. Transferring Nelson’s designs to such an unusual canvas took hundreds of hours and careful planning. Advertisements are regularly applied to the outside of light rail vehicles, but they rarely take over the inside the way Nelson’s illustrations do. The unusual display was made possible by an arts program connected to St. Thomas’ Sustainable Communities Partnership. Through the partnership, students work with community partners on projects that support human and environmental well-being. The project was also supported by the SOLV Initiative, a St. Thomas’ College of Arts and Science program that, in part, seeks to support the public interest through arts and the humanities. The artwork will remain in place through at least the end of May. But Professor Mike Klein, who led the students whose interviews provide the foundation for the book and light rail artwork, said he hopes it leaves an impression that lasts well beyond its lifetime.